The aftermath of the 2009 L’Aquila earthquake was marked by social fragmentation and isolation in resettlement sites. Cultural work emerged as a central aspect of recovery initiatives, aimed at reconnecting dispersed survivors. This article explores how local artists envisioned their contribution to recovery from catastrophe, namely as the production and performance of utopian imaginations in particular spaces, seeking to connect divided Aquilani. Cultural initiatives approached the notion of utopia pragmatically: with historic neighbourhoods, in which sociality used to be produced, off-limits, dispersion and envy made the building of new shared spaces necessary. These spaces were often cultural. However, rather than envisioning cultural events as momentary, artists aspired to shape enduring relationships and recovery. Their work challenges approaches that depict the culture industry as conquered by late capitalism’s neoliberal, enjoyment-centred experience economy. 1When an earthquake devastated the central Italian city of L’Aquila on 6th April 2009, the metropolitan Italian and international media coverage focussed on the suffering of the survivors and the loss of architectural heritage. Founded by the Holy Roman Emperor, Frederick II, in the thirteenth century, L’Aquila had been a showpiece of stunning baroque and renaissance architecture. It boasted a grand historic centre, characterised by large condominiums arranged around picturesque squares, dotted with fountains, benches, and flowerbeds. Imposing churches and colourful palaces marked every angle of the centro storico – the historic city centre – the pivot of social and cultural community life. Some mediaeval churches had survived a previous earthquake in the eighteenth century, which razed large parts of the city; they stood as reminders of central Italy’s exposure to seismic dangers. 2Tucked away in a remote Apennine mountain valley, L’Aquila was an inconspicuous place. The earthquake brought the city – with a population of 70,000 people – to global fame. With 309 casualties, hundreds of injured survivors, and thousands of destroyed or damaged buildings, the then Prime Minister, Silvio Berlusconi, declared a state of emergency for L’Aquila and the Abruzzo region. 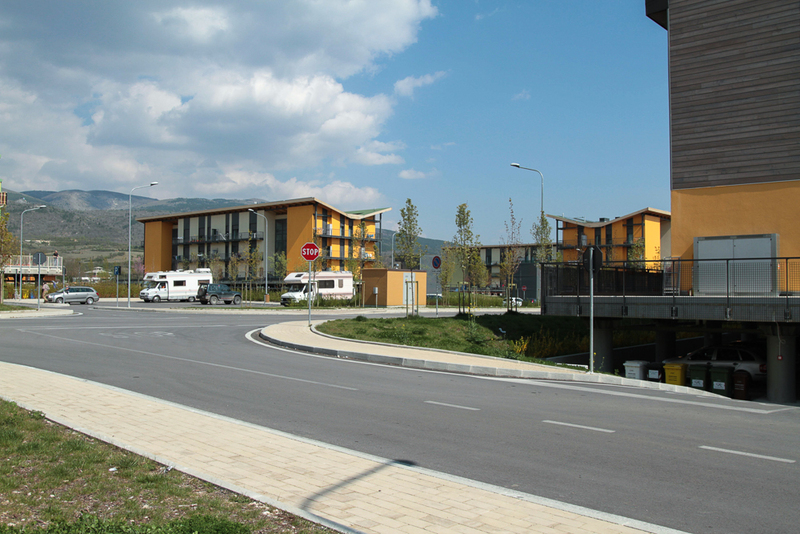 The Civil Protection Agency evacuated almost all residents to one of 170 hastily erected tent camps or to temporarily requisitioned hotel resorts on the Adriatic Coast (Alexander 2010). Tens of thousands of Aquilani lost access to their city. 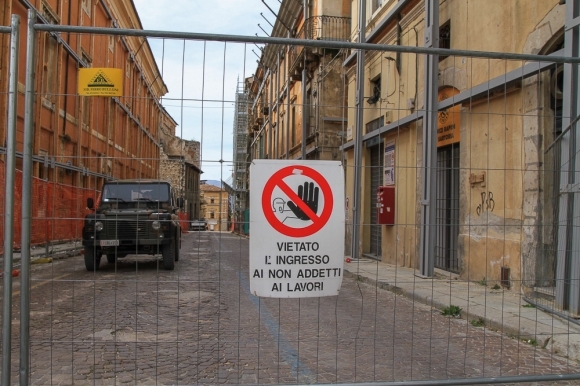 A complete ban on entering the historic centre was imposed, enforced by Italian soldiers, to the dismay of former residents. A lively, atmospheric university town – with numerous bars, clubs, churches, theatres, university faculties, and scenic squares – transformed into what the survivors began to call a città fantasma, a ghost city. 1 The instigators even stood trial, but were eventually acquitted (Il Messaggero 2013). 4The “wheelbarrow people”, as this movement became known, showed what many survivors thought of Berlusconi’s approach to recovery. Instead of focussing its efforts on the reconstruction of heritage and architecture in the historic centres of L’Aquila and of surrounding towns and villages, the Italian government constructed nineteen permanent resettlement sites on greenfield areas in L’Aquila’s rural periphery, called Progetto CASE, as well as dozens of semi-permanent resettlement sites of wooden huts, called Progetto MAP. Isolated and remote from familiar, functional urban spaces, Aquilani quickly lamented that the resettlement sites prolonged the initial catastrophe through ongoing displacement, rather than alleviating feelings of despair and uncertainty (Erbani 2010). The decision to spend over one billion Euros on the 185 prefabricated housing blocks, which rest on anti-seismic pillars and accommodate around 16,000 people, has been widely criticised: EU institutions (which funded the constructions) denounced the waste of public money, accusing the authorities of ignoring corruption, while survivors deplore forced displacement and solitude, resulting from a lack of urban planning attentive to local needs (Ciccozzi 2011; European Court of Auditors 2013). When, or whether, the displaced survivors will be able to return to their abandoned historic homes remains uncertain. 5Nonetheless, the recovery effort was initially praised by the international media, which even dubbed it Berlusconi’s rise “from zero to hero” (Popham 2009). Pundits applauded the Prime Minister for relocating Italy’s G8 summit of world leaders from a Sardinian island to the devastated city, purportedly to bring attention to L’Aquila’s plight (BBC 2009). Survivors protested against the waste of financial resources, denouncing what they considered a bombastic spectacle among ruins that wilfully reduced their suffering to a dramatic backdrop, allowing Berlusconi to present himself as a generous saviour alleviating local suffering (The Huffington Post 2009). Progetto CASE peripheral resettlement site. Photograph by the author. 6In 2012 and 2013, over three years after the earthquake, I conducted ethnographic fieldwork in L’Aquila, tracing the social and cultural repercussions of the disaster by analysing how a natural catastrophe was transforming into individual and collective crisis experiences. The state of the historic centre was discouraging. While the rehousing sites had been completed within months, in the summer and autumn of 2009, no attention had been paid to the restoration and reconstruction of houses and monuments in historic centres across the affected area. Following an enthusiastic interlude, led by the “wheelbarrow people”, inaction had resumed: Aquilani themselves had been able to clear the streets, but they then had to reckon with the need for coordinated government planning to guarantee restoration and reconstruction, which they found missing. Grassroots initiatives could not be successful without official schemes and generous funding. 7Previously inhabited by over 22,000 Aquilani – many of them students at the city’s university – L’Aquila’s centro storico remained uninhabited at the time of my fieldwork. Large parts were still under control by the Italian army, to the frustration of many Aquilani, who voiced their anger over what they considered an “occupation” by outsiders. 8In the centro storico, almost all houses and monuments had been buttressed and clad in steel scaffolding, as if frozen in time. The old town was a melancholic and harrowing place. The few accessible streets lay abandoned; the authorities had installed rat bait boxes in streets and squares; dust-covered shop windows still advertised the 2009 spring sale. At night, only a handful of streets were illuminated, and the local youth entered the sealed-off, dangerous areas to annoy soldiers, who unsuccessfully chased them around the narrow lanes that L’Aquila’s teenagers knew better than their pursuers. 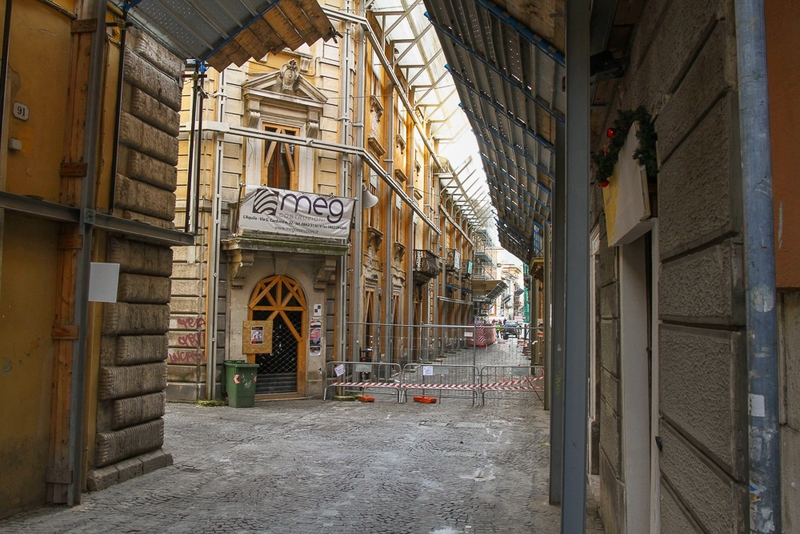 Scaffolding and steel frames stabilising buildings in L’Aquila’s historic centre. Photograph by the author. 9A dozen of bar and shop owners had obtained temporary special permits to reopen their venues on the ground floor of buildings that had sustained little damage in accessible areas within the historic precincts. One such square, Piazza Regina Margherita, at one end of the city centre’s main street, the corso, exhibited remnants of pre-disaster urban life. A number of bars and restaurants had reopened in the vicinity. In the early evening, Aquilani flocked to this pocket of apparent normality for the traditional aperitivo. In the warmer summer months, the square filled up regularly. Students and residents struggled to fit into the few available venues. They relished the temporary return of an almost normal type of sociality amidst the architectural ruins of their home city and amidst the psychological ruins of uncertainty that plagued mundane, everyday existence. 10Late at night, the centro storico regularly turned into a bizarre scene of drunkenness and debauchery, framed by architectural decay. The Piazza Regina Margherita, surrounded by semi-ruined buildings barely held together by steel-frame scaffolding and wire rope supports, brimmed with partygoers dancing in front of L’Aquila’s empty homes, now cold and damp from years of abandonment. Uninhabited, narrow lanes and scenic stone doorways, plunged into pitch-black darkness, became open-air urinals. With no residents to make a noise complaint, bar owners placed loudspeakers on the square, blasting the latest summer hits through the gloomy, historic streets, thronging with students frolicking and drinking until the early hours. 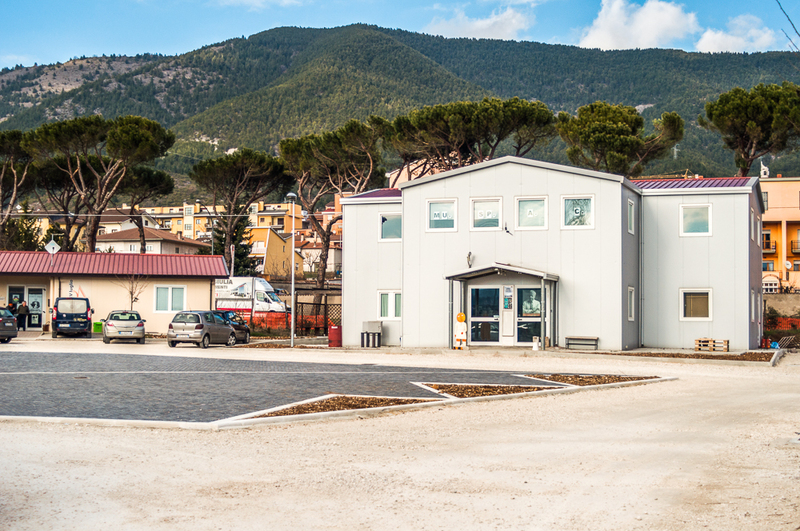 After the earthquake, the government had suspended tuition fees at L’Aquila University, and teaching had already resumed in containers and large marquees by the autumn of 2009. Three years later, L’Aquila’s students were enjoying a strange kind of unchallenged hedonism as a new way of life in a post-disaster city that most Italians had forgotten as rapidly as it had appeared on the nation’s television screens in 2009. 11Faced with the greatest economic downturn since 1945, successive Italian governments have not considered the reconstruction of a small student city a priority. Over the course of five years, between 2009 and 2014, the country had four different Prime Ministers. The political instability undermined local hopes for a better future. At the time of my fieldwork, survivors were still wondering how long their state of exception would last. They struggled to envision a future in which they could return to the city centre and remake a sense of normality. They desired the return of everyday social life in historic homes, monuments, and squares. While the reconstruction of the centro storico was a shared concern, I found that the displaced survivors also emphasised the need to remake the city’s social fabric (tessuto sociale). Local interpretations of what is necessary for recovery were not limited to the survivors’ traumatic inner worlds (Fassin and Rechtman 2009; Feldman 1991) or to material reconstruction (James 2006; Yoneyama 1999), but emphasised the remaking of a sense of community, which, for Aquilani survivors, meant relating to one another by sharing disparate experiences of suffering and disaster, by producing spaces of exchange and sympathetic understanding. Heap of debris left in L’Aquila’s historic centre, framed by decaying houses. Photograph by the author. 12A range of cultural initiatives sought to provide occasions for survivors to come together, share memories of the past, and create mutual sympathies. Against the background of uncertainty, destruction, and social dispersion, such occasions were intended to provide utopian imaginations of a better future, marked by a new kind of normal sociality in a restored historic city. In their accounts, artists and creative Aquilani emphasised that they were motivated by a perceived “need” or “necessity” to recount stories publicly and to engage in creative production, so as to reconstitute fragmented relations between local people. 13I suggest that numerous creative initiatives in post-disaster L’Aquila pursued utopian imaginations pragmatically, concerned with the production of necessary occasions for reflection, sociality, and sympathy. Creative Aquilani’s approaches to producing possible utopian worlds did not aim at large-scale social transformations, but rather at reconnecting survivors who had thus far sought primarily to overcome impacts from the disaster in their private lives: mourning, trauma, suffering, financial compensation, family life, and unemployment. Community existence had not been a major concern for dispersed Aquilani. Through cultural work, local artists sought to provide a particular utopian impulse, reconnecting disaster survivors that, with the disappearance of traditional urban spaces, struggled to relate to one another as a community of people with a shared fate, and not just as a network of disparate individuals. Army vehicles and fences in L’Aquila’s historic centre. Photograph by the author. 14Pragmatic approaches to the production of utopian forms in post-earthquake L’Aquila, shaped by artists and others involved in cultural work, connected the importance of storytelling with everyday sociality and with material urban spaces. Artists’ involvement revealed important ways in which utopian imaginations should feature as neglected aspects of cultural recovery. Importantly, L’Aquila’s artists described their initiatives as reactions to political decisions that had neglected local needs in the aftermath of destruction and displacement. They articulated Aquilani voices about the city’s future, juxtaposing local utopian imaginations with the government’s claim that rehousing survivors had constituted the major challenge, which the authorities had successfully managed. 15In “Relational Aesthetics”, Nicolas Bourriaud (2002) suggests that contemporary art (beginning in the 1990s) has been predominantly concerned with the production of ephemeral relations among spectator-participants, thus creating what he calls micro-utopias, or microtopias. For Bourriaud, the centrality of momentary participation and interactivity in the works of artists such as Rirkit Tiravanija, Henry Bond, and Pierre Huyghe illustrates a change in artists’ aspirations, since art “is no longer seeking to represent utopias; rather, it is attempting to construct concrete spaces” (ibid. : 46). Such spaces, however, do not expand beyond their emplacement, often in galleries or other semi-public forums, thus surrendering the aspirations of previous artwork, namely, to represent utopia and to transform spectators. 16Beginning with Thomas More’s famous book of the same name, published in 1516, the term “utopia” has captured the imaginations of those seeking to “organize the world according to a grand plan” (Parker 2002: 1). Future-directed utopian imaginations have usually taken one, or more, of three forms: the Garden of Eden and unspoilt romantic nature; the ideal city-state, democratic or communistic; or the paradisiacal land of plenty (Reedy 2002: 172). In his nineteenth-century utopian novel, “News from Nowhere”, William Morris developed an idyllic, peaceful, and humane counter vision to the unpleasant urban life of industrial Victorian England. His utopian future inverted the workplace-centred, exploitative, and often destructive – both of nature and of human health – everyday reality he knew. Utopianists dealt in grand transformative visions, to remake human life fundamentally. The ultimate objects of transformative work were human beings, for example, in utopian socialisms or in the new urbanisms of the twentieth century (Fishman 1988). 17In the 1990s, however, after the colossal projects of National Socialism, Fascism, and Soviet Communism had brought tragedy and suffering, the notion of utopia as a large-scale, directed transformation of individuals became problematic (see Goodwin and Taylor 2009). This also had an effect on how artists engaged with utopias. Bourriaud’s theorising of contemporary art as microtopian should be seen in this light: instead of generating profound transformation, concrete and ephemeral social relationships emerge as the realistically desirable outcome of engagement with creative work. 18Taking a cue from Louis Althusser, namely that art and culture are not mere reflections of society but shape it, Bourriaud both analyses and advocates relational aesthetics. He does not dismiss completely the utopian aspiration to shape social forms – and hence he does not surrender the term “utopia” –, but he limits its scope to the construction of momentary relations between strangers in concrete instances. Microtopias are short-lived moments that do not seek to change the future; their creators are content to instigate a limited social encounter. The utopian future has been replaced by a microtopian present. Artists no longer desire to transform the inner worlds of those who engage with their work, so as to create different kinds of persons, fit for a utopian future; they simply provide the enjoyable experience of spontaneous social connectedness. 20Bishop redirects our attention to an important aspect: emergent relationships differ in depth, content, and participants. Bourriaud, Bishop claims, neglects these differences, and she urges us not simply to explore in what way a microtopian relation can be brought about, but also to distinguish between emergent relationalities. While Bishop identifies different kinds of relationships, she still agrees with Bourriaud’s description of their microtopian character: with a focus on the here and now, artists abandon earlier aims to envision better futures and to shape human aspirations. 2 I would like to thank an anonymous reviewer for encouraging me to highlight this point. 22What I propose to explore, however, are art forms that challenge this distinction between the neoliberal, microtopian aspirations of contemporary creative industries, on the one hand, and the transformative aspirations from utopias of earlier creative work, seeking to create different persons and societies, on the other. I suggest that contemporary artists have not universally surrendered the desire to be utopian in the profound sense. Nonetheless, I argue that the prefix “micro” should be retained, but not to indicate the pleasure-orientated, neoliberal experience economy. Instead, it signals the limited objective of cultural work to transform a local reality or community life, instead of macro aspirations to change society, the nation, or the world. 23I find the concept of everyday utopias, described by Davina Cooper (2014) useful to think through my observations in L’Aquila. Cooper’s everyday utopias are not artworks, but pockets of non-standard social practices in a world shaped by the ordinary, the controlled, and the predictable. After short ventures into the excitement of everyday utopias, people return to their routines. Cooper’s examples are public nudism, a transgender bathhouse, or Speaker’s Corner in London: enclosed spaces that allow practices that offer “glimpses of something else and other” (ibid. : 44), through novels forms of diversity, participation, and democracy. 24Cooper calls her everyday utopias “promising spaces”, rooted in the present and connected with concrete circumstances, since “everyday utopias are neither temporal nor spatial islands. Their proximity to mainstream life is a defining feature of their existence, of what they are capable of achieving as well as the constraints under which they operate” (ibid. : 221f.). Her everyday utopias have enduring material presences – institutions or buildings – and thus contrast with the ephemeral presentism of Bourriaud’s and Bishop’s microtopias. 25Cooper’s concept develops Michel Foucault’s notion of heterotopias: “counter-sites, a kind of effectively enacted utopia in which the real sites, all the other real sites that can be found within the culture, are simultaneously represented, contested, and inverted” (Foucault 1986: 24). Cemeteries, gardens, and hospitals, Foucault argues, constitute commonplace heterotopias: sites and spaces that force us to reflect upon our own lives, our position towards nature, and the experience of our own bodies. Through such reflections, we open up spaces for introspection, and thus also for development and change. Cooper’s everyday utopias constitute such spaces in which to reflect on the ordinary. 26Nonetheless, Cooper suggests that her everyday utopias are also conservative. The prospects they might offer to shape a different kind of reality beyond the defined sites of engagement are neglected by those who establish and maintain those spaces: “everyday utopias assert the importance of maintaining and sustaining what is, rendering the pursuit of further change secondary to securing and protecting existing forms of innovative practice” (ibid. : 223, her emphasis). Albeit with a different focus from Bourriaud’s and Bishop’s inauthentic and present-orientated experience economy, Cooper also highlights the limited scope of everyday utopian possibilities. They are pockets of difference that strive to coexist with what engulfs and thus shapes them, not to transform. 27What happens, however, when conserving what is does not suffice? When utopian imaginations are necessary to escape from a situation of despair and destitution? What happens, for example, when people struggle to remake a life in the aftermath of a cataclysmic event? Under those circumstances, preserving the status quo is not enough. I thus turn to an exploration of innovative cultural work – in my case, community theatre – to stress the importance of a neglected aspect that is central to understanding what motivates people to imagine and perform utopian possibilities: necessity and pragmatics. 28The initiatives I document from L’Aquila make us rethink utopian impulses as not simply confined events. Instead, I show how utopian imaginations can be invoked pragmatically in reaction to violent changes, serving as anchors to stabilise new kinds of reality at times when certainty and communal life have been replaced with despair and isolation. The utopian impulse spills over from concrete sites of engagement. Art professionals viewed the utopian imaginations I discovered in creative performances as being vital for disaster recovery, enacted as recollections of a harmonious, purposeful pre-disaster past in shared urban spaces. Pragmatic approaches to utopia shape creative work in L’Aquila. Post-disaster cultural productions reveal how utopian possibilities can serve as roads to better, collective futures, and not simply as individualist micro forms that permit consumption of short-lived experiences, on the one hand, or as pockets of alternative practices that nonetheless preserve everyday reality, on the other. 29As soon as I had arrived in L’Aquila in January 2012, I noticed the vibrant creative cultural and art scenes, despite the city’s tragic circumstances. Walls displayed posters advertising daily plays, readings, exhibitions, and book launches. Since most traditional cultural spaces in the historic centre remained inaccessible – damaged or destroyed –, performances were staged in makeshift container theatres, outdoors, or in other temporary constructions across postwar neighbourhoods, where the repair of less damaged housing blocks from the 1960s and 1970s was progressing faster. Cultural initiatives sought to achieve at least two objectives: providing substitute spaces to counter the disappearance of sites of pre-disaster social life in the historic centre, and reversing fragmentation and isolation among Aquilani dispersed across rehousing sites, hotels, and other forms of resettlement. 30Contrary to positive accounts of post-disaster sociality, which emphasise solidarity and emergent community life amidst equalising circumstances in the immediate aftermath of catastrophe (Solnit 2010), I found that everyday life in L’Aquila at the time of my fieldwork was marked by tensions. Experiences of the emergency and of the relief operations had differed. While some Aquilani had suffered losses in the family, evacuated to faraway hotel resorts with their former homes destroyed, others had sustained little material loss and lived in government-administered tent camps near the ravaged city. The inhabitants of postwar neighbourhoods had begun returning in late 2009 already, whilst the residents of historic parts had been assigned apartments in peripheral resettlement sites. 31Initially, the Berlusconi administration had generously distributed government hand-outs. Claims for repair work in postwar houses were processed fast. Informants reported that many Aquilani had unjustly used these funds to renovate their attics and bathrooms with state money, whilst others languished in uncertainty about the future of their devastated homes. At the time of my fieldwork, there were serious doubts about the government’s financial ability to reconstruct the historic centre, and displaced Aquilani resented those who lived outside badly damaged areas, purporting that they had been extravagantly and unjustly compensated. Rather than creating a collective disaster experience, the government’s favouring of resettlement over reconstruction and over long-term recovery divided Aquilani and intensified frustration and fragmentation. 32In one public meeting with L’Aquila’s mayor, Massimo Cialente, about the utility bills for the resettlement sites, tensions found expression in envy and mutual accusations. In early 2013, the municipal authorities sent bills to the inhabitants of resettlement apartments, adding up the costs of the previous three years. However, instead of individually metred consumption, the administration had divided total consumption by the floor space of individual flats. Those who claimed to have been particularly frugal felt cheated and sought to confront the mayor. 33In a large white marquee in one of the resettlement sites, brimming with outraged citizens, Cialente was facing a backlash for his administration’s decision to split the bill. Sitting on a plastic camping chair, he struggled to reason with his fellow Aquilani: “If you still lived in your old houses, you would have to pay the bills, too.” “Yes, we will, when we’re back”, an angry pensioner retorted. The mood was confrontational, although some Aquilani were calm and offered to pay their bills, but correct ones, and not based on floor space. Someone suggested using the revenue from resettlement block solar panels, but Cialente shook his head and explained that they are not public property; they belong to a private investor. “Criminals”, a young woman whispered to me. “Those who still live in hotels don’t have to pay anything!”, someone shouted, and a group supported him with applause. The atmosphere was heated and the audience divided. In those first hours of sunlight, it stared you in the face. Little was spoken. From your house, the epicentre of your earthquake, you walked further. Aftershocks continued. If you could do more than crying, you sought to understand how much of your life had remained in place. You stumbled around the historic centre, before they would close it forever, trying to comprehend. Just after the dust blanket had settled, and before the aid givers arrived: precisely the moment in which change felt imminent. In the following months, your house is a blue tent. The alternative is a room in some faraway hotel – too far to understand what’s happening in your city; and too far to understand what others are doing to what used to be yours. Control is slipping away. For a short moment, we were all the same. Today, the differences are beginning to weigh us down. Your friend irritates you when he returns from his hotel on the coast, with his clean shirts but completely ignorant of what others are deciding for him. But it unnerves him that he does not have a clue about the things that you know, dirty and tired as you may be, but informed. Piazza D’Arti in L’Aquila’s periphery. Photography by Francesco Paolucci and Giuseppe Dania. 36One year after the earthquake, the account illustrated the harrowing consequences of disaster: isolation, self-centredness, and growing resentment. Sebastiani coined the phrase “your earthquake”, to conceptualise destruction and terror that afflicted every Aquilano and every Aquilana predominantly individually. Those in tent camps envied other evacuees for their comfort in hotels, while survivors in holiday resorts begrudged camp residents for being closer to their home city, producing fragmentation and anger. Rather than seeing themselves as a community of survivors, Aquilani experienced envy, struggle, and solitude. Local artists sought to deploy the possibilities of creative work to counter these divisions. 37In response to dispersion and dislocaton, a number of local cultural initiatives founded the Piazza D'Arti in the vicinity of L'Aquila's postwar hospital, shortly after the city's devastation. The Piazza D’Arti turned a previously abandoned periphery into a temporary gravel square, squeezed between the undeveloped retention area of L’Aquila’s Aterno river and a major artery connecting suburbs with the centre. The Piazza was framed by a handful of makeshift, large-scale containers, containing two theatres, a library, a café, and a volunteer project for disabled people. Every week, cultural associations staged dance workshops, cabaret, plays, readings, and other events in the unattractive cubes. The events were much frequented, with cars clogging up nearby roads. The Piazza D’Arti was a response to the earthquake. No doubt about it. There was a need for public spaces for the displaced population, which had been catapulted into this incredible situation, dispersed across hundreds of tent camps and hotels, with people living far away from each other. We needed a place for people to get together, to share memories and impressions. We needed a project to reconstruct the social fabric. The associations and groups that founded the Piazza D’Arti sought to bring together Aquilani through a project pursued by local activists, volunteers, artists, and others involved in the cultural sector. Culture is a key component of recovery in L’Aquila. We wanted to recreate what everyone had lost in the earthquake: la piazza. It is the place of local civic and social life, where people meet daily for a chat, to discuss politics, to have a coffee. In the piazza, people debate ideas and create new initiatives. In Italy, the piazza is the heart and soul of every village, town, and city. It is the only place for true encounters amongst citizens. 39Rafaelle’s account illuminated what Aquilani identified as a particularly painful dimension of loss in the earthquake´s aftermath: the lack of shared spaces, in which survivors could act as local citizens, as members of a civic urban community. The Piazza D’Arti initiative provided a space for encounter. It created pockets of what had become otherwise unreachable forms of sociality, modelled by memories of the past, to counter realities of dispersion and dislocation. 40Importantly, for Rafaelle, the initiative did not simply provide a temporally and spatially contained refuge, but sought to reconstruct the social fabric, permanently remaking an urban community. 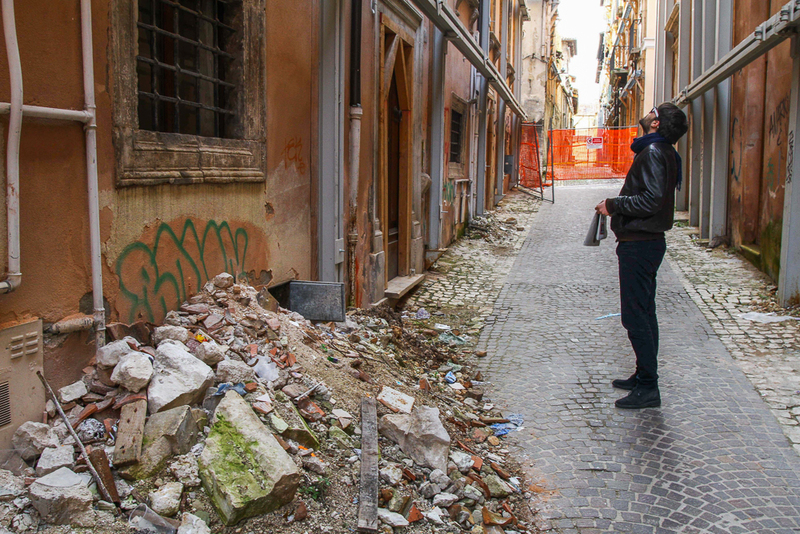 The fragmentation lamented above – leaving every Aquilano and every Aquilana stranded with his or her own earthquake – was the shared reality the Piazza D’Arti initiative wanted to reverse. Rafaelle and others conceptualised the cultural project as a necessary aspect of recovery. With the Piazza D’Arti projects, artists approached the modelling of a different, utopian future pragmatically. The Piazza’s unsightly metal containers showed this: their practical ugliness contrasted vividly with pre-disaster urban social life, framed by baroque churches, fountains, and renaissance palaces in the historic old town. 41The initiative fits Cooper’s (2014) description of an everyday utopia, or Foucault’s (1986) heterotopia: a site that is both like and unlike reality, thus offering a glimpse of a potential possible. However, rather than preserving the reality that exists around it, content to instigate reflection, Rafaelle desired the initiative to venture beyond its limited emplacement in particular cultural events. Maintaining the status quo was precisely not enough for the organisers. Instead, they sought to engender transformation by recreating pre-disaster sociality. The sense of being part of a civic community resurfaced as utopian imagination. Makeshift container theatre in Piazza D’Arti. Photography by Francesco Paolucci and Giuseppe Dania. 42On the eve of 6th April 2013, in commemoration of the fourth anniversary of the city’s destruction, the industrial-size theatre container on the Piazza D’Arti hosted a play called “Mille Giorni”, or “One Thousand Days”. 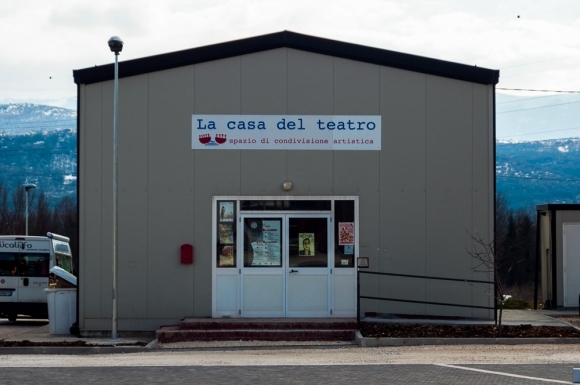 The small theatre was filled to the last seat, even though the play had been performed in L’Aquila previously. With the city preparing to commemorate the destruction with a torch march, a public reading of the victims’ names, and a range of other events on 6th April, this performance of “Mille Giorni” was special. 43The stage is sparsely decorated. There is only one actress, Gloria, a local artist, who plays Antonio, an Aquilano. The play starts just before the earthquake. Throughout the play, Gloria changes her clothes and tone of voice repeatedly, slipping into other roles to complement Antonio. She performs a range of diverse Aquilani experiences from the first three years, or one thousand days, of the earthquake’s aftermath. The Civil Protection Agency arrives. They install themselves in our towns and villages. Our mayors are reduced to celebrating weddings. People push trolleys to the coaches that take them to the coast, guided by men and women in uniforms. They build the first tent camp. The city is evacuated. Antonio, like other Aquilani, tours L’Aquila’s shopping centres, hoping to find his city. The optician along the high street is now in one remote shopping mall. The place where he used to buy his jackets is in another one. The bar, where he had his coffee, moves next to a peripheral supermarket. L’Aquila has been fragmented into lots of shopping centres. 45Antonio’s one thousand days are a tale of urban transformation and loss: the city that he used to inhabit routinely, knowing places as well as people, has disappeared. Shopping centres fail to compensate for the lack of cobbled streets, mediaeval churches, squares, and the cultural intimacy (Herzfeld 1997) of everyday life. Antonio speaks with evacuated Aquilani about their traumatic evacuations to hotel resorts. They disclose distressing experiences: having to share a room with one’s elderly parents; months of sleepless nights; surrendering privacy; and a sense of guilt for having left L’Aquila in its darkest hour. This is the story of Antonio. Unemployed. Divorced. Dead. If the earthquake hadn’t saved him. Now, he has forgotten, like many others, but I haven’t forgotten. In my mind, I walk to the Piazza Duomo. The market with the fruit and vegetable stalls. There are chickens and pecorino cheese. Shoes, underwear, vests, socks, tights. “Ciao Alessia! Shall we have a coffee? What? At the Rocco stall? No, I’ll go there later. Too many people now.” Nurses, students, elderly ladies with their walking frames. I stroll underneath the nearby cloisters. At the next corner, I take a look at Grimaldi’s music shop. I bought my first LP here, “Imagine”, by John Lennon. Further along, I spot a photograph of the L’Aquila rugby team, proudly dressed in our colours: black, for sorrow after the 1703 earthquake, and green, for hope. I am in Piazza Palazzo. On a bench, a student revises for her biology exam. Piazza Dei Gesuiti. Colacchi’s shop window is full of books. The newsagent. The florist. Walking towards Piazza San Pietro, I pass the trattoria Da Lincosta. After the play in L’Aquila’s theatre, the actors will dine here together. It’s the evening. Music, laughter, voices. Thursday. Student night. 48With those words, the stage fell dark. Many Aquilani were visibly moved, and the applause lasted for minutes. During the following reception, Aquilani discussed the play. “My brother-in-law was deported to a hotel, too, near Giulianova. He was depressed all the time. It was terrible”, a middle-aged Aquilana explained to a teenager. He nodded: “We had to change apartments a couple of times, too, but I met a girl in one of the places and we’re still together today.” The woman smiled broadly. On the eve of a day of painful commemoration, survivors used the opportunity to share recollections and experiences from the destruction with each other. Gloria’s story of Antonio and the play provided an opportunity to discuss and relate to one another, seeking to understand diverse experiences of destruction, displacement, bereavement, resettlement, and recovery. Time had to pass, to gain distance from the earthquake. otherwise it wouldn’t have been a lucid account. Three years was the right time. The earthquake had been covered widely in the media, but many of us in the city felt that there hadn’t been an objective account of our experiences. Reporters said what they wanted to say, or rather, what others wanted them to say. It was propaganda, not information. By contrast, in the play, we focus on the human dimensions, which were ignored during the emergency operation. People were reduced to numbers. There was a need to give space to people’s voices, to reach the audience emotionally. Theatre is very powerful for this. We interviewed over thirty Aquilani, aged between twenty and seventy, about their memories and circumstances. We spoke with people who had losses in the family, and other who did not even have property damage. Some had been evacuated to the coast; others had stayed in tent camps. Some lived in the Progetto CASE resettlement sites; others had returned to their repaired homes. We had a range of different accounts, to bring out the diversity of experiences. I also found that people had an enormous desire to talk and to share: from the head of the fire fighters to local teenagers. But they didn’t simply want to talk as a therapeutic thing: they wanted to communicate their experiences to help others understand. We didn’t have any preconceptions when we collected people’s accounts. Obviously, being the actress and also a personal witness, my point of view does feature. But there are also many aspects I had never thought about. That is why I didn’t just want to talk about my own experiences. The play is a monologue; but it contains a range of stories, like a chorus. It is as if lots of people were merged into one. 51In the fictional character of Antonio, the experiences of diverse Aquilani merge into a single account. Antonio personifies everybody’s and nobody’s earthquake, permitting a range of Aquilani to identify with him and to see the lives of others through him simultaneously. 52We should recall that shortly after the earthquake, Aquilani began experiencing social fragmentation as a result of disparate experiences of catastrophe. Every survivor was stranded with his or her personal earthquake. Antonio unified such individual experiences as a dramatic persona. Interestingly, Gloria, an actress, chose a male character, Antonio, as the protagonist, as if to encompass gendered experiences. Gloria assumed different male and female roles, playing old and young Aquilani, throughout the play. 53I suggest that as a particular example of creative work, “Mille Giorni” engaged with what Aquilani identified as growing individualisation, division, and misunderstanding: the war among the poor. Gloria’s performance sought to highlight the shared dimensions of post-earthquake histories. Enacting different stories as if they were a single person’s life course, Gloria sought new forms of communication among survivors. Her desire to bear witness to what had really happened was not only directed at other Italians, but also at fellow Aquilani, who discussed their past enthusiastically after the performance on the eve of the earthquake’s anniversary. I witnessed discussions and conversations following “Mille Giorni” on a number of occassions, both in L’Aquila and in Pescara, a coastal Abruzzo city to which many Aquilani had relocated after the earthquake. 54For Gloria, “Mille Giorni” confronted a perception that individual disaster experiences were inexplicable to others. The play constructed a shared symbolic framework by arranging authentic accounts into what emerged as the collective history of a dispersed population. “Mille Giorni” provided something distinctive for L’Aquila’s survivors: an occasion to relate to each other, overcoming the divisive effects of catastrophe. 55Utopian imaginations can take many shapes, since they are “intimately tied to the historical and social milieu in which they arise” (Grey and Garsten 2002: 10). They can be anarchist, embracing diversity, tolerance, and difference (Reedy 2002); they can be political, pursuing grassroots activism to counter global corporate culture (Fournier 2002); and they can even be managerial, striving to use technology and efficient management to create a better, controllable world (Law and Mol 2002). What connects them is an aspiration for the “good” life: and “[t]he good in this respect is something that must be imaginatively conceived” (Robbins 2013: 457). The need or necessity to imagine, and to pursue, a different reality in fragmented post-disaster L’Aquila, riven by envy and fights over access to financial compensation, shaped the particular approaches to utopian imaginations that I call pragmatic. 56Artists and others in the creative sector pursued what Alex Flynn and Jonas Tinius have described as political performance, that is, “metaperformative actions and performativity as action intended to incite transformation” (Flynn and Tinius 2015: 4). However, while Flynn and Tinius emphasise the individually transformative potential of such acts, which echoes the neoliberal experience economy of Bourriaud’s microtopic art, I have drawn attention to the enduring role of collectivity and of communal life in other utopian projects. Some people think that a cultured person is someone with lots of books. I don’t consider that culture. For me, someone is cultured when he or she is perfectly integrated into the social world that surrounds him or her. Culture means being connected with your environment: developing deep knowledge of what happens around you. If an event can make you lose this connection, or at least fracture it, then cultural work can help you re-establish a close link. 58Gloria’s interpretation of culture underlined her aspiration to produce social relations and to reconnect fragmented survivors with the social world around them, achieving better knowledge and what she described as integration. The Piazza D’Arti project recreated the piazza as the pivot of local sociality, enabling the kind of centro storico community life that had disappeared with the earthquake. Rafaelle identified cultural work as crucial for reconstituting the social fabric. Culture, sociality, and recovery intersected closely for him, as well as for Gloria. 59Nicholas Long and Henrietta Moore have pointed out that human sociality does not simply require spatial co-presence. Instead, it depends on the “human capacity for virtuality, for endowing things of the imagination and the mind with meaning and significance” (2012: 20). In L’Aquila, too, the Piazza D’Arti was an important material space, but it had to be filled with cultural work that stimulated reflections on communal life. “Mille Giorni” was the kind of project that sought to remodel people’s imaginations: impelling survivors to understand others and their personal struggles with disaster-induced crises. I contend that this intention, expressed by Gloria, can expand our understanding of microtopian aspirations. Here, however, the term “micro” does not denote the kind of ephemeral pleasure of spontaneous and uncommitted connectivity, experienced as characteristic of late capitalism’s neoliberal consumption, which Bourriaud describes. Rather, the aspiration is micro-utopian because it seeks to transform only a local reality, community life, thus foregoing aspirations to change the world on a grand scale, according to future-orientated blueprints. 60Cooper’s everyday utopias, or heterotopias, cannot quite capture the importance artists attached to culture in the aftermath of the earthquake. Preserving what is, while allowing pockets of difference, was not enough for Rafaelle or Gloria: the present had to be transcended in ways foreshadowed by the utopian imaginations that featured in theatrical performance as memories of a better past. The artist performed local, authentic narratives, seeking to create lasting community ties to counter the divisive effects of disaster, destruction, and displacement, which had dispersed an urban community into individual survivors, each of whom struggled with his or her particular disaster trajectory. 61The approaches to utopian imaginations were pragmatic. Rafaelle and Gloria emphasised that the Piazza D’Arti initiative and “Mille Giorni” were responses to the earthquake, and both spoke about a “need” and a “necessity” to remake a sense of community life. Pragmatic approaches to utopia expose pockets of imagination and practice in which an urgent sense of absence necessitates reflections on better worlds, and on how they can be achieved. 62In L’Aquila, furthermore, the direction of utopian imaginations was rooted in a nostalgically remembered past: both Rafaelle and Gloria considered the sense of civic community, something that had been lost through the earthquake. The disruptive event conditioned reflections on reconstruction and return. The utopian projects that emerged in cultural activities in post-earthquake L’Aquila were pragmatically constituted in response to something that had gone missing: they were reparative, seeking to remake relationships, foster understanding, and enable a sense of shared fate that would stretch beyond the performance event. 63My examples from L’Aquila challenge Bourriaud’s claim that the utopian impulse has disappeared from contemporary creative industries. They show that not all art forms in late capitalism are simply orientated towards, as well as conditioned by, the experience economy. During times of distress, cultural work still offers possibilities to strive towards a real, different future, drawing inspiration from memories of a better past, which was – at least in recollection, which might be romantically enhanced – characterised by communal life and by dwelling in shared, historic, urban spaces. Alexander, D. E. 2010. “The L'Aquila Earthquake of 6 April 2009 and Italian Government Policy on Disaster Response.” Journal of Natural Policy Research 2, no. 4: 325-342. BBC. 2009. Italy's Minimalist G8 Summit. <http://news.bbc.co.uk/1/hi/world/europe/8145847.stm> (accessed 22 August 2013). Bishop, C. 2004. “Antagonism and Relational Aesthetics.” October 110: 51-79. Bourriaud, N. 2002. Relational Aesthetics. Dijon: Les Presses du Réel. Ciccozzi, A. 2011. “Catastrofe e C.A.S.E.” Il Terremoto Dell'Aquila. Analisi E Riflessioni Sull'Emergenza, (ed.) U. d. S. Dell'Aquila, L'Aquila: Edizione L'Una. Cooper, D. 2014. Everyday Utopias - the Conceptual Life of Promising Spaces. Durham/London: Duke University Press. Erbani, F. 2010. Il Disastro. L'Aquila Dopo Il Terremoto - Le Scelte E Le Colpe. Rome: Laterza. European Court of Auditors. 2013. Special Report No 24/2012 - the European Union Solidarity Fund's Response for the 2009 Abruzzi Earthquake: The Relevance and Cost of Operations. Luxembourg: Publications Office of the European Union. Fassin, D., and R. Rechtman. 2009. The Empire of Trauma: An Inquiry into the Condition of Victimhood (trans. R. Gomme). Princeton/Oxford: Princeton University Press. Feldman, A. 1991. Formations of Violence: The Narrative of the Body and Political Terror in Northern Ireland. Chicago: The University of Chicago Press. Fishman, R. 1988. Urban Utopias in the Twentieth Century: Ebenezer Howard, Frank Lloyd Wright, Le Corbusier. Cambridge (Mass. ): MIT Press. Flynn, A., and J. Tinius. 2015. “Reflecting on Political Performance: Introducing Critical Perspectives.” Anthropology, Theatre, and Development - the Transformative Potential of Performance, (eds) A. Flynn and J. Tinius, Basingstoke: Palgrave Macmillan. Foucault, M. 1986. “Of Other Spaces.” Diacritics 16, no. 1: 22-27. Fournier, V. 2002. “Utopianism and the Cultivation of Possibilities: Grassroots Moments of Hope.” Utopia and Organization, (ed.) M. Parker, Oxford/Maiden: Blackwell. Goodwin, B., and K. Taylor. 2009. The Politics of Utopia - A Study in Theory and Practice. Bern: Peter Lang. Grey, C., and C. Garsten. 2002. “Organized and Disorganized Utopias: An Essay on Presumption.” Utopia and Organization, (ed.) M. Parker, Oxford/Maiden: Blackwell. Herzfeld, M. 1997. Cultural Intimacy: Social Poetics in the Nation-State. New York/Abingdon: Routledge. Il Messaggero. 2013. Terremoto, L'Aquila, Tutti Assolti Nel "Processo Alle Carriole". <http://www.ilmessaggero.it/ABRUZZO/terremoto_l_39_aquila_tutti_assolti_nel_quot_processo_alle_carriole_quot/notizie/331860.shtml> (accessed 20 December 2014). James, J. 2006. “Undoing Trauma: Reconstructing the Church of Our Lady in Dresden.” ETHOS 34, no. 2: 244-272. Law, J., and A. Mol. 2002. “Local Entanglements or Utopian Moves: An Inquiry into Train Accidents.” Utopia and Organization, (ed.) M. Parker, Oxford/Maiden: Blackwell. Moore, H., and N. Long. 2012. “Introduction: Sociality's New Directions.” Sociality: New Directions, (eds) H. Moore and N. Long, Oxford: Berghahn. Parker, M. 2002. “Utopia and the Organizational Imagination: Outopia.” Utopia and Organization, (ed.) M. Parker, Oxford/Maiden: Blackwell. Popham, P. 2009. “Berlusconi Turns Adversity to Political Advantage after Quake; the Italian Leader's Energetic Reaction to the Disaster Has Been a PR Triumph.” The Independent, 10 April. Reedy, P. 2002. “Keeping the Black Flag Flying: Anarchy, Utopia and the Politics of Nostalgia.” Utopia and Organization, (ed.) M. Parker, Oxford/Maiden: Blackwell. Robbins, J. 2013. “Beyond the Suffering Subject: Toward an Anthropology of the Good.” Journal of the Royal Anthropological Institute (N.S.) 19: 447-462. Sebastiani, M. 2010. “Preface - L'Aquila Anno Zer0.” L'Aquila Anno Zer0, edited by M. D'Antonio. Rome: Ded'A. Solnit, R. 2010. A Paradise Built in Hell - the Extraordinary Communities That Arise in Disaster. New York/London: Penguin. The Huffington Post. 2009. G8 Protesters Strip Down, Scale Smokestacks, Occupy Power Plants. <http://www.huffingtonpost.com/2009/07/08/g8-protesters-get-naked-s_n_228061.html> (accessed 1 September 2014). Yoneyama, L. 1999. Hiroshima Traces: Time, Space, and the Dialectics of Memory. Berkeley: University of California Press. Zizek, S. 2009. First as Tragedy, Then as Farce. London: Verso. Jan-Jonathan Bock, « Approaching Utopia Pragmatically: Artistic Spaces and Community-Making in Post-Earthquake L’Aquila », Cadernos de Arte e Antropologia, Vol. 5, No 1 | -1, 97-115.